When Sanzen Digital first met Paulette Elliott, MD of Huduma Ltd, in the summer of 2016 at a Chamber of Commerce event, it prompted us to do two things. Firstly, to come up with a good excuse to meet her again; and as a result of that, to start a series of interview style blog posts. Where we pick the brains of successful small business leaders who inspire us, and from whom any small business with genuine ambitions to grow can learn from. She is a one woman driving force (in what is still a male dominated sector) for positive change and making a measurable difference where it matters – through collaborating, mentoring, and networking. Two directors, two graduate interns, and a number of strategic partners and support entities, including the European Space Agency. Harwell Space, Science and Technology Campus, in Oxfordshire. Paulette has a career spanning 30 years in the IT and telecommunications sector, including 10 years at Vodafone. She became a sole trader in 2010; eventually setting up Huduma Ltd in 2011. A number of projects delivering key emerging technologies, including RPAS (Remotely Piloted Aircraft Systems) technology. Shortlisted for two business awards based on Huduma’s apprenticeship training programme and the use of science technology and innovation. 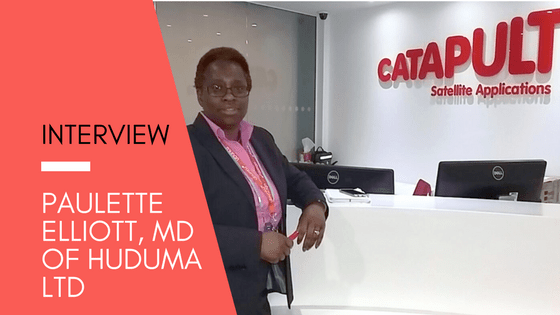 Sanzen Digital’s interview with Paulette Elliot, Huduma. SD: What has been your biggest challenge as an SME and how have you met the challenge? PE: The biggest challenge is having the financial resources to deliver innovative R&D projects. Some of the organisations who provide the funding do tend to forget that SMEs may not have a bank account with large reserves and might be a team of only one. But I find that if you collaborate with other businesses who have been successful in gaining funding then it not only helps you to be able to submit joint applications for funding – but also to develop your ideas as well, especially if it’s contributing to the overall goal of the project. SD: How do you think your competitors view you? PE: I’m a micro business and the arena I’m operating in is more to do with large and medium sized companies. When I see other businesses doing something similar to myself I don’t see them as a competitor or shy away from them; I see opportunities to collaborate. SD: Have you had any mentors or role models? And how has being mentored helped you? PE: I briefly joined Athena which is a women only business network and although it wasn’t the best fit for my business; it did help to ‘soften’ me. I learned a different sets of skills – on how to pitch my business in 60 seconds for instance. But since then, I’ve participated in a number of different initiatives such as The SETsquared Partnership, Growth Accelerator and the Thames Valley Support Vouchers Scheme. And at Harwell, I attend workshops which are often run by successful entrepreneurs; it makes sense to listen to what they say! Through mentoring I get business ideas and ways of doing things better and more efficiently. I don’t know everything, so I’m always open to learning new things and listening to people who know more than I do. PE: Over the years I’ve been mentoring a number of different start-ups. I’m involved with an organisation in London called Bright Ideas Trust, It helps individuals from deprived areas who want to start their own business, as well as start-ups from other backgrounds. I have also employed summer interns through the Satellite Applications Catapult SPIN programme as part of our internship programme to help develop their business, marketing and organisational skills. SD: What role does digital marketing play in the success of your business? PE: It opens up opportunities and gives potential clients visibility about Huduma. We started looking at social media more seriously towards the end of last year. I worked on a set of objectives for 2017 for which we’re now in the process of working out a marketing strategy. Digital marketing is now crucial because I’m looking to grow Huduma and the way we can grow is identifying the digital platforms we would use to reach our target audience. SD: In addition to your new responsive website, what other digital platforms have you found useful? PE: For me Twitter is gradually building a nice following, and also LinkedIn, where my core audience and 1300 plus connections are. We use Twitter to inform and share information regarding technology or business advice. I deal with decision makers and it’s on LinkedIn I can research someone and contact them directly. SD: How much digital marketing do you outsource or do in-house? PE: It’s all done in-house by our graduate intern Ellie, who is currently working on a marketing strategy document. But if we are to target the right audience with the right message – especially when it comes to disseminating and sharing information – then it would help to have a second opinion before we implement the plan. We’re serious about growing and so the proposed strategy needs to be reviewed and discussed at a strategic level. SD: What’s the most exciting thing in the horizon for Huduma? PE: I think the most exciting thing is the RPAS project, the intelligent parcel delivery part of the project, because when implemented, it’s going to have a huge impact on the UK economy. It also means Huduma is going to grow and employ more staff. SD: What advice do you have for other entrepreneurs and what do you wish someone told you when you were starting out? PE: I think the one thing I’d probably tell people starting out is think about what it is you want to do and achieve. And don’t be afraid to bring other people in to help you, because you can’t achieve it all on your own. SD: What can you tell us about yourself that we wouldn’t get from your resume? PE: That I’m a deeply principled person. Injustice towards employees really gets me especially where you have organisations who do some really distasteful things to staff. That really rattles my cage. Also on a personal level, meeting my husband simply transformed me as a person and he is a kind and caring person. We’ve been married for almost 30 years and I’m truly blessed having him in my life. Sanzen Digital helps businesses to grow on-line. If you’d like to know more about how you can use digital marketing to expand your business – connect with us today.